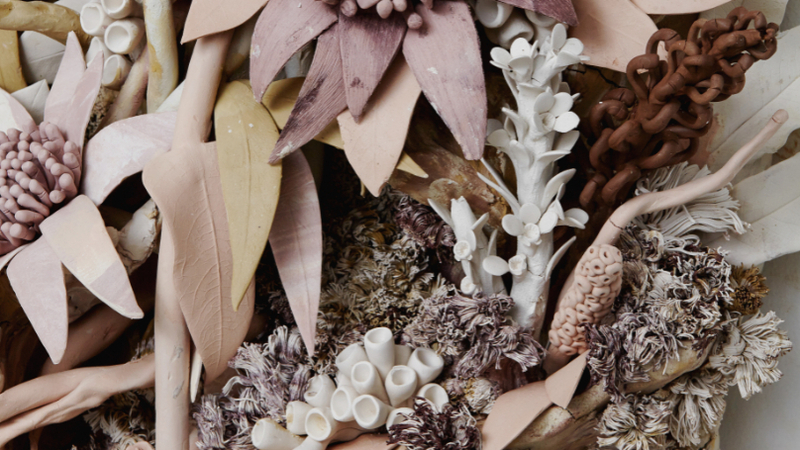 Sculptural ceramicist Alice Couttoupes has “borrowed clay” from one of her favourite coastal spots in Sydney to make the work featured in her latest exhibition. “I love working with my hands; I’m very much a three-dimensional maker,” she says. “[Clay] is such a tactile material, and there are endless ways of working with it. The artist has been awarded three travelling scholarships since she graduated from UNSW Art & Design with a Combined Bachelor of Arts, Bachelor of Fine Arts with Honours (First Class) five years ago. The clay fruits of one of those scholarships, The Freedman Foundation Travelling Scholarship for Emerging Artists, will be on display at UNSW Galleries from September 28 until November 3. The $5000 scholarship, which the 29-year-old won in 2016, enabled the sculptural ceramicist to undertake a two-month residency in France and exhibit at the prestigious Bernardaud Foundation in Limoges. “It was an exhibition of artists working in clay from around the world whose work draws inspiration from flowers and plant life,” she says. “Having an opportunity to meet and really bond with people who share my somewhat obsessive interest was quite special. 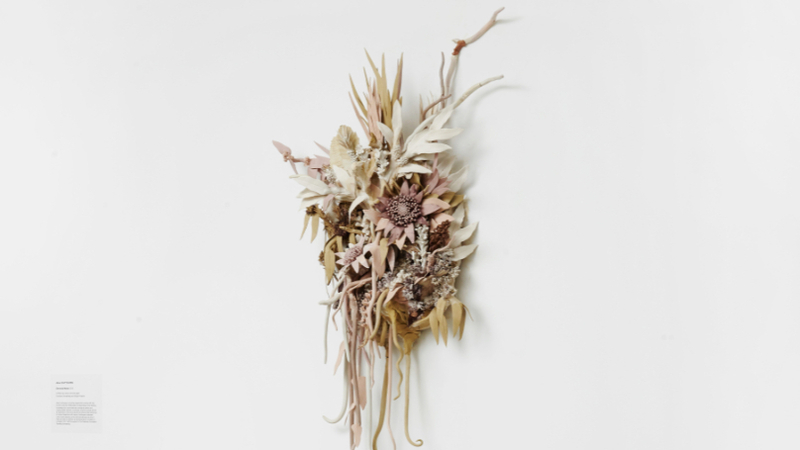 She says audiences attending The Freedman Foundation Travelling Scholarship for Emerging Artists can expect to see “a big wall hanging work, of unfired clay representations of Australian plants local to the site around Darlinghurst and Paddington”. “Drawing on some of the research for a project I did with Underbelly Arts Festival 2017, I looked into the site [Darlinghurst area] pre-colonial settlement and found out what kinds of vegetation covered the landscape. She says she chose not to fire the clay work “in a way to pose a question of ownership”. “By denying any permanence or enduring object hood to the sculpture, it can’t be treated as a commodity,” she said. This year, Alice Couttoupes was also awarded the Art Gallery of New South Wales’s Eva Breuer Travelling Art Scholarship. The $25,000 prize will enable her to travel to Paris to take up a three-month residency at the Dr Denise Hickey Memorial Studio. In 2015, she was awarded $20,000 as a recipient of The Marten Bequest Travelling Scholarship, which she used to fund study trips to China and Japan. Alice says she’s not sure she chose art as a career. “I just love making, and would have figured out a way to ensure I could continue that regardless of my circumstances,” she says. The Freedman Foundation Travelling Scholarship supports artists to develop their practice through study, residency or mentorship. Since its inception in 2000, the scholarship has enabled more than 85 emerging artists to expand and enrich their studio practice in Australia and abroad. It culminates in an exhibition of works by the current year’s winners of the scholarship, as well as 2016 recipients of the award, at UNSW Galleries. This year’s exhibition has been curated by Yarran Gatsby, who received a Curatorial Scholarship from The Freedman Foundation through UNSW Art & Design’s Masters of Curating and Cultural Leadership program. “This year’s exhibition engages with a variety of materials, possibilities and ideas, capturing a moment in which the profoundly austere and the wilfully playful come together like a string of multifarious narratives,” Mr Gatsby says. The Freedman Foundation Travelling Scholarship and Curatorial Scholarship are administered by The National Association for the Visual Arts (NAVA) on behalf of The Freedman Foundation. NAVA general manager Penelope Benton says the exhibition is important in demonstrating the impact that international travel can have on the development of professional artistic practice. "Each year we bring back the scholarship recipients from the two years prior to share the work that they made which was inspired by their overseas journeys, and it is just remarkable to witness how this program stimulates the practical and conceptual thinking that each artist applies to their work, and ultimately, to their careers," she says. This year’s exhibition will feature works by the 2018 recipients: Lu Forsberg, Caroline Garcia, Mimi Kind, Jimmy Nuttall, and Shireen Taweel, alongside works by 2016 recipients Alice Couttoupes, Brigitte Hart, Olivia Koh, Anna McMahon and Georgia Saxelby.